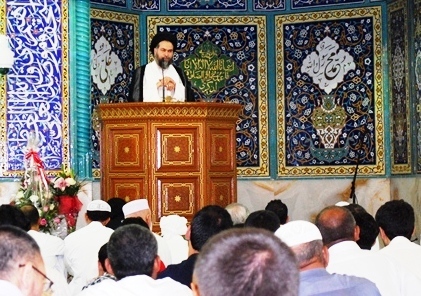 On 7th September, the Friday prayer was held in Imam Hussein (a.s) Mosque Dubai by Ayatollah Sey’yed Mahmoud Madani. The following is brief of the first sermon. He continued his previous subject of virtue and obtaining the lessons from Amir-Al-Momenin (a.s) and told we reached to the sentence of the sermon of Mottaqin that says:” Vala yahifo ala ma’yobghedh”. It means that the righteous person will never be cruelty against his enemy and won’t decay his right. He continued that normally in our daily life there are some people that we like them and assume them as our friends and some we don’t like that assume them as our enemies. The way that we should base our friendship or be enemy to others is different subject that is not our subject to discuss and will be expressed later. In general we have right to be friend to some people and enemy to some others but this sentence says that the virtue means that even little oppression or cruelty should not be applied to the enemy on his rights. He brought some examples and told suppose you are in position and working somewhere and one of your enemies comes to you to do something for him. You have no rights to act personally and oppose him due to his act on you in other subject. You should have the justice and perform your duty on job without any cruelty on him. Also he brought the example of how Imam Ali-ibn-Abitalib act and advised his son to do if he passed with Ibn-Muljam who was his killer and explained that Imam told you have no right to do anything else rather than beating only one as he has beaten one on me. He was taking care about Ibn-Muljam’s food and health and divided his food with him. Then he prayed that Allah grant all of us the achievement of being a righteous person. After that he continued his regular discussion about the exemplary society. He told “we entered the discussion that what the exemplary family is. Then we discussed that any kind of historical achievement of the human being is gage to the successful families. And whatever bitterness and fail we experiment has a root on failed and un-success families. So it is important to recognize the succeed family and know how it would be. He continued that we told the main and top character of an exemplary family is that the love flows between the members and they love each other and it is the base of the family. The man loves his wife and the wife loves her husband and both of them love their children and children also love their parents and the love is the binder of the family. Ayatollah Madani continued by example of the family which love each other and another that has no love in between. He used the building as an example that has made up of bricks and told if there were not used the cement in between of the bricks and they have set over each other and the house has shaped. He explained that such a building has some characters like if someone lay back to the wall of this building, the wall would demolish. Second is that the openings between the bricks will allow others to look at your private life anonymously. Third character is that the walls not keeping the house warm in winter and heat will escape through the openings of the bricks and in summer as you try to keep it cool would be impossible as the heat will come inside because of the holes between the bricks. So if the family is like this kind of building if even a small problem happens between them they will go to the court to divorce as the love cement has not filled the bricks. He continued and noticed that you may never find a couple that has no argument in between, of course there are different manners and styles in every person. Your finger prints, pattern of your eye, smell of your body etc are different to each other also the manners and styles also are different but if love comes between would dissolve all these problems. If love would not be applied, for each manner and style would raise a quarrel, from the taste of the food to talking manner, putting the clothes on and …. He brought an example of a couple came to mosque office to get divorced. He explained that I listened to them to find out may be a serious problem in between and they have right to divorce but after couple of hours listening to their speech I found there is nothing to make them divorce but their arrogance and I told them both of you are so arrogance and unwise. “I never used to talk like this but you deserve to be told like this” I told them. You are not even ready to think for the reason you are going to divorce! When love is not in between, it is loose but if there is love, even serious happenings in life they will tolerate and forgive each other. He explained the second character which was the confidant. Why the secrets of your life should be opened out of your family? The love family would keep the secrets inside. The man tells the secret of his wife to his colleagues or the wife open the weakness of her husband to her friend. Even if you correct yourself but the memory of others will remain. The third character he explained that is the keeping the house warm. He continued that in the family which is lack of love, they have sat down to have their lunch but would never enjoy the food. The man works hard to outside to bring income to family but he never joys of being in family. He continued that the love will not come by itself and go by itself and pointed that there are couples that the husband tells I don’t like my wife or the wife says that I don’t like my husband. They think that the kindness and love would be raise by it and is not obtainable. If the love was not obtainable they would never tell that the love toward the Ahl-ul-Bait is obligatory, it means that you can obtain it otherwise how it could be obligatory. So we should find the ways we can create the love between the couples, parents and children. He explained that I’m going to finish this subject in this sermon so asked them to listen carefully. He explained that one of the main ways to create the love is to think about power points of the other side. He told that yes there are too many weak points in your wife but have you ever thought about her abilities and good characters? The first spec that she / he have is that he / she is Shia of Ali-ibn-Abitalib (a.s). just consider your wife she is the lover of ahl-ul-bait so you love her too as a Shia and put the love on Fatima (s.a)’s account that I love her for the sake of you O’ Fatima(s.a). Secondly she is keeping her Hijab among the horrible city that everyone has his own style of clothes but she is keeping her chastity. Is this a low value? Or the other side there is too many Haram ways to earn money but your husband tries to get Halal income and bring it to family. Is it a less value to think for? Or think that your wife has born these pure children and has reached to the death point every time she delivers baby, are these less value? We should think for each and every one. There are too many other points but it will make the sermon lengthy if I continue but if you think for these points the love will be created in between. He continued to second point which is the saying the love. He told that the express of love will bring more love. There will be miracle in empathy. We have Hadith that prophet (PBUH) has told that if you say to your wife that you love her will last in her heart forever! He continued that we have referees that coming to mosque office and claiming that their parents doesn’t like them. We explain for them how it would be no love as they kill themselves for you to prepare whatever you like in your life and don’t love you? As we are not explaining to our children how they should know? They need time to reach to the point to know but that time will be late. We should tell them how much we love them now. He explained as his last point that we should express our love to the relatives of each other. He explained that if you tell your wife that I dislike your mum or dad, she never ignores them but you will miss your place in front of her. She will never leave her family because of you. Vice versa if she says to you don’t like your mum she will spoil her face before you. Repeating the love express towards the relatives of your wife/husband will increase the love in between. He praise Allah to enable us to perform our duties on its best and reviewed his speech in a few words. He pointed that the love toward the family should be along with the satisfaction of Allah and if the love to Allah comes in between should be prior to whatever else. He pointed that the next week will be the Martyrdom of Imam Jafar As’sadiq (a.s) and he is going to explain that in second sermon and invited people to attend in ceremonies in this regards and condoled this happening and told we proud of this great Imam as Shia and Sunni both are the users of his knowledge.